Notes: Utilized by seminal artists and home for legendary albums throughout the years, Tascam have stayed true to manufacturing rugged, compact, feature-rich song-writing and demo tools. The DP-006 is the most compact solid-state multi-track recorder on the market. 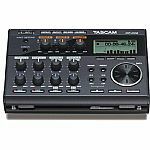 Tascam equipped it with 6-channels (2 x mono and 2 x stereo/mono), selectable track modes, built-in high-quality stereo condenser mics and 2 x mic/line inputs. This recorder will easily fit into any gig bag, pocket or suitcase. Song ideas can happen anywhere and with the DP-006 you're ready. Jot down all of the key components to your songs using these professional sounding multi-track recorders. Be ready wherever creativity strikes. For elongated battery life these models can connect directly to Tascam's external battery pack (BP-6AA) via USB. The DP-006 is built with 2 x condenser microphones directly in the front of the units. Record vocals or acoustic guitar anytime without the need for extra equipment or set-up time. Tascam held many evaluation tests to secure the best sounding microphones and structures. Modeled after the top-selling DR series microphones, you can be assured you're receiving top-quality, Moreover the DP-006 was designed with a tripod mount for versatile set-up and placement. The DP-006 is optimally designed for on-the-spot recording. No unnecessary features were included that might complicate the recording to ensure easy functionality. Designed with Analog functionality and dedicated control knobs the Pocketstudio is the simplest to use songwriting scratchpads on the market. The DP-006 features ultra light-weight designs to ensure portability. The DP-006 is 360g (without AA batteries). The DP-006 has 2 input terminals by phone-jack, these terminals provide to connect an external microphone, an electric-acoustic guitar and a line-level device like a synthesizer. If you prepare any conversion cable, a tablet device like a iPad will be able to connect. (Conversion cable is not included) It supported file import/export by WAV format. Also, mono file and stereo file are available. This feature offers various advantages. For example, at first, you import an instrumental song which created by a DAW. Then, your ideas capture by the DP-006. After recording, these ideas can export from a DP, you can be editing and mixing raw song data and recorded data on your DAW. The DP-006 supported file import/export by WAV format. Also, mono file and stereo file are available. This feature offers various advantages. For example, at first, you import an instrumental song which created by a DAW. Then, your ideas capture by the DP-006. After recording, these ideas can export from a DP, you can be editing and mixing raw song data and recorded data on your DAW. Tascam's DP-32SD Digital Portastudio records an unmatched 32 tracks to solid-state media. Up to eight tracks can be recorded at a time through its combination XLR and 1/4" combo jacks. Input processing like compression and limiting are available during recording, as well as guitar amp simulation and multi-effects for use with the instrument-level input. A color LCD and channel strip knobs make mixing fast and creative. 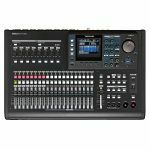 With its great sound, powerful features and easy operation, the DP-32SD is Tascam's biggest Portastudio yet. The DP-32 has 12 selectable tracks between MONO or STEREO. Use a STEREO track for recording synthesizer, or set the track to MONO when recording guitar or vocal. Not only that, you can create ideal settings for each track. (set #9 to #12 STEREO, then set #13 to #22 MONO) If all tracks are set to MONO the DP-32 becomes a 20-track multi track recorder. Notes: The SD-20M is a simple-to-use solid-state recorder at a breakthrough price. 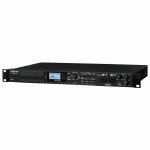 The 1U rackmount includes a pair of microphone preamps with phantom power for direct microphone recording. Both the mic inputs and line inputs can be recorded simultaneously in four-channel mode. The dual recording mode captures a copy of your audio at a lower level, as insurance against distorted takes. The SD-20M includes a battery backup system - AA batteries can keep recording for hours in case of power loss. A wired remote or footswitch can be attached to control recording and playback. Variable speed playback allows the playback to be changed without affecting the pitch.